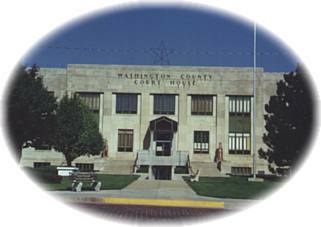 Washington City came into being in 1860, one year before Kansas became a state, being founded by Mr.'s Ballard, Bowen, and Pierce. After the end of the Civil War, settlers came more rapidly and the town began to grow. The coming of the Union Pacific Railroad to the county was celebrated in 1877 and the Burlington Railroad in 1884. Today, Washington is a small town that has it all! Located in North Central Kansas at the junction of US 36 and K-15, Washington is a proud, caring community that invites you to share their relaxed, quality way of life. Over 200 head of buffalo roam the pastures throughout three counties on the ranch owned by Lester C. Lawrence. A portion of the herd may be seen along K-9, north Clifton, where the ranch headquarters is located. The cabin originally was built in 1882 by the John Pecha family near Odell, Nebraska, and was moved to Washington in 1970 by the Fidelia Study Club.